Last week, we paid tribute to On, the creator of EyezMaze, for his game Tontie Hammer, the main inspiration for the gameplay of Kawaii Killer. Today, we’d like to focus on the music. We did not make the sounds alone, we worked with Audioplum Studio for the sound design. We had already worked with them for the prototype of the game during a Game Jam, Kawaii Must Die, and we wanted to continue with them. We gave them some guidance concerning the music we wanted, but they were also given creative freedom. First, they sent us two versions for the main theme for the title screen. The first was a J-Pop version with some retro sounds, which was discarded. The second was more rhythmic and used 8/16 bits / General Midi sounds, with some battery and electric guitar. 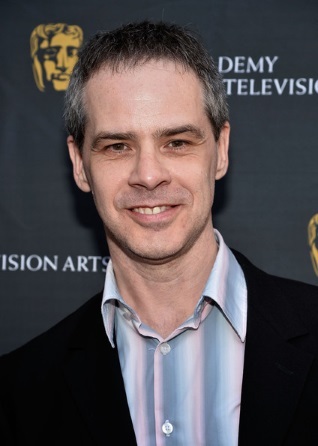 Behind this rock’n’roll style was what was to become the essence of the OST, It is a style I love thanks to another composer: Grant Kirkhope. The melodies Audioplum sent us reminded me of Banjo-Kazooie, one of my favorite games. I immediately added this in the inspiration’s list, because Audioplum did not know about Banjo Kazooie nor Grant Kirkhope. We removed the battery and electric guitar and kept only the “kawaii” part of the music. The other musics came easily, with the inspiration of Banjo-Kazooie and the talent of Audioplum. “The musics of Kawaii Killer are inspired from games like Banjo-Kazooie and Mario Bros. (my childhood was full of Mario melodies…). Even though I referred to the Chip Tune movement, I tried to bring more modernity to the sound by incorporating 16 bits sounds, especially a guitar at the end of the main theme. This game has some retro references, but it has in my opinion a more contemporary soul, that’s why I tried to keep away from pire 8-bits sounds (e.g. NES sounds). Indeed, the speedrun music is very particular, because it’s composed of 3 different tracks. These are played depending on the player skill. 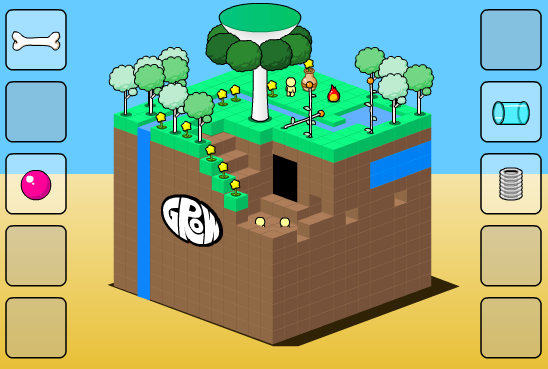 In the beginning, the music is quite simple, but it gains new instruments and effects if the player does not make mistakes. 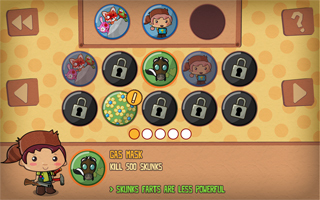 The game environment also changes with the music, going from a grey and cloudy landscape to a more colorful and happy one. This cohesion between the gameplay and music comes also from Banjo-Kazooie, the most obvious example being the main hub theme: “Grunty’s Lair“. The melody is always the same, but the instruments change depending on where the player is. When the player is next to the aztec world, the melody is played by a pan flute, with voices saying some kind of mystical words. But when the player approaches the island level, two accordions play a pirate version of the theme. And this principle can be found through the whole game, each level having its theme modified multiple times depending on the player location. For instance, the Click Clock Wood level has 24 different tracks, which are played depending on the season and the player actions. A few weeks ago, Grant Kirkhope published the absolutely-complete soundtrack of Banjo-Kazooie, with every music used in the game. It’s interesting to hear these variations and imagine the amount of work done on this game. 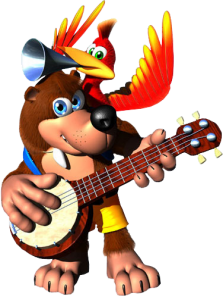 This music can be found here: Banjo​-​Kazooie: Everything and the Kitchen Sink! Thank you Grant for this amazing work! We are very happy with the Kawaii Killer music, and we hope that our next games will have a high quality soundtrack as well. In the art of video-games, like many others, we look for inspiration from the games, movies, books we like. We take the best, get rid of the rest, and mix everything with other interesting concepts found here and there. Finally, we add our touch and balance everything to make the result consistent. Today, Tabemasu Games would like to make a tribute tribute and thank the game that inspired Kawaii Killer, and also the developer behind it: On. You may not know this name (I can’t blame you), but you may know his site, EyezMaze, a collection of games On has made for more than 10 years. The mos t well known game series he’s created is the Grow series. In these games, the gameplay is very simple: You have at your disposal a certain number of options, and you have to play them in the good order to win. But the magic comes from all the crazyness emanating from the game’s animations. You never know what will happen with a certain object before you use it. A bowl can turn into a futuristic vegetal spire building, while springs can transform into mushrooms when exposed to golden water. The solution to the puzzle comes by experimenting multiple orders, trying to understand the logic of all the possible interactions. I recommend you to play the following versions, which are my favorites: Grow Cube and Grow RPG. But Kawaii Killer has nothing to do with the Grow series! Another game has inspired us to create Kawaii Killer: Tontie Hammer (ver. 0). Basically, it’s a Whack-a-mole game, in which creatures come out of the ground through 9 holes. To eliminate them, you must press the correct numeric key (e.g. 3 for the bottom-right hole). Obviously, this game is meant to be played with a numeric keypad, which every PC had back in the days this game was released (around 2004). 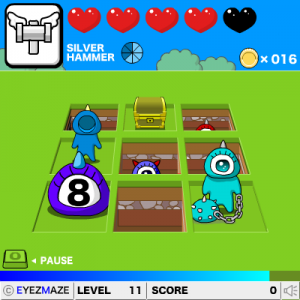 The first level is easy, enemies die with a single blow of your hammer, but the second level welcomes a new enemy, which has 2 health and must be tapped twice. And a new type of enemy will add to the others every time you finish a level. Some will require more hits, some will hurt you or steal your money if you hit them when you shouldn’t, etc. A special mention to the “numeric bubbles”, which require to press the number displayed on them instead of the number they are on. Nasty. 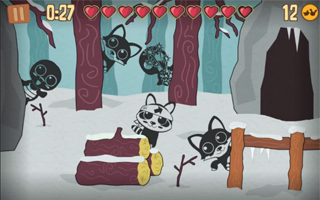 In Kawaii Killer, the game structure is very similar, a new creature joins the gang at every level, and the speed in each level increases with time. Basically, that’s it, but it’s the core of the gameplay. Apart of that, the enemies are quite different, because of the mobile platform we’re on. In Tontie Hammer, there is only one gesture: press the button, and the variety comes from the different number of HPs of each enemy and their patterns. 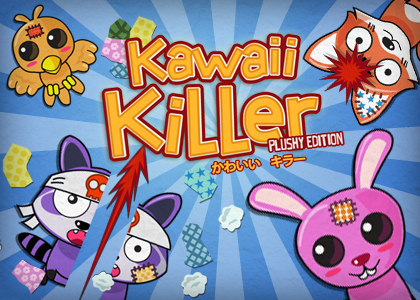 In Kawaii Killer, we extended to many more: tap, slice, push, circle, tickle, tear apart, etc. If you possess a numeric keypad, do not hesitate one more instant and try the game! 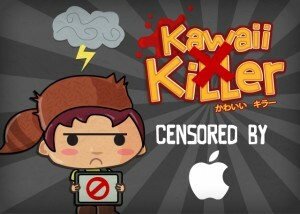 Finally, Kawaii Killer comes back to the AppStore, so Apple fans will be able to play the entire game and enjoy its Arcade mode, Challenges and Speedrun mode! It’s available on the iPhone, iPad and even the iPod Touch! And for those who possess an Android tablet or smartphone, even though the original gore version is still available on Google Play, this Plushy Edition is more convenient for children. Now go and slay these evil plushy creatures! Today’s a bad day for Tabemasu Games: Our first and only game, Kawaii Killer, just got removed from the AppStore less than a week after its release. 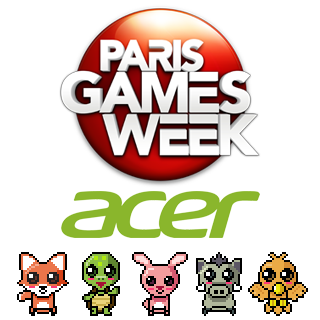 The reasons stated to me by mail and phone are that “The app concept is not appropriate for the App Store in its current state” and “Killing adorable animals does not meet the AppStore guidelines“, even though the game was approved two months ago, they said that “it should have never been approved in the first place“. We even had been featured by Apple, meaning we were on the front page for the “Games” page, and we sold more than 1000 units, which was really satisfying for the first game from a totally unknown studio such as ours. When you work with Apple, if you have an sensitive app, you have to count on to get approved. More atrocious apps than Kawaii Killer have been on the app store, with more blood or realistic violence. Blend the Boss by Joe Cartoon is a good example. In this game, you have to put your boss in a Blender, pure gratuitous violence. BloodyXmax or Draw Slasher do have a lot of blood too, but they’re killing bad guys and zombies. And don’t panic, GTA San Andreas, Ultimate Mortal Kombat 3 and Call of Duty: Black Ops Zombies are still available on the AppStore! We were just reviewed by the wrong guy I guess. Kawaii Killer is still available on Android smartphones and tablets on Google Play (with a demo) and on the Humble Store. For those who bought Kawaii Killer on iOS, you may have noticed that some features were missing, like challenges. Don’t worry, it’s normal! You just have an old version of the game. The reason is simple: Apple rejected the newest version of our game because of “realistic images of people or animals being killed“, even though the previous version, not less gore, was accepted. 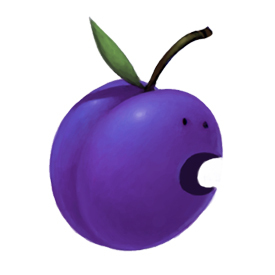 We’re discussing with Apple right now to fix this, so you can have the new version as soon as possible. When everything is settled, you’ll just have to update your game for free. We’re deeply sorry for this. 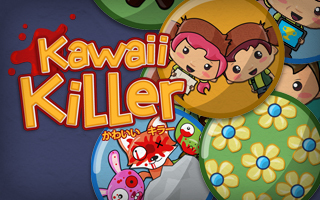 Kawaii Killer on the App Store and Google Play! You wanted it? Here it is! 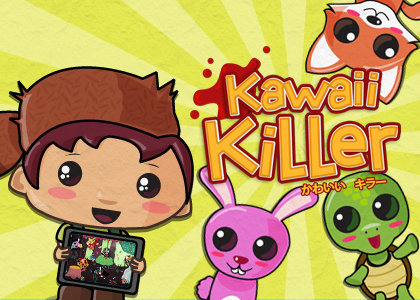 Kawaii Killer is available on the Appstore and Google Play for your smartphones and tablets! 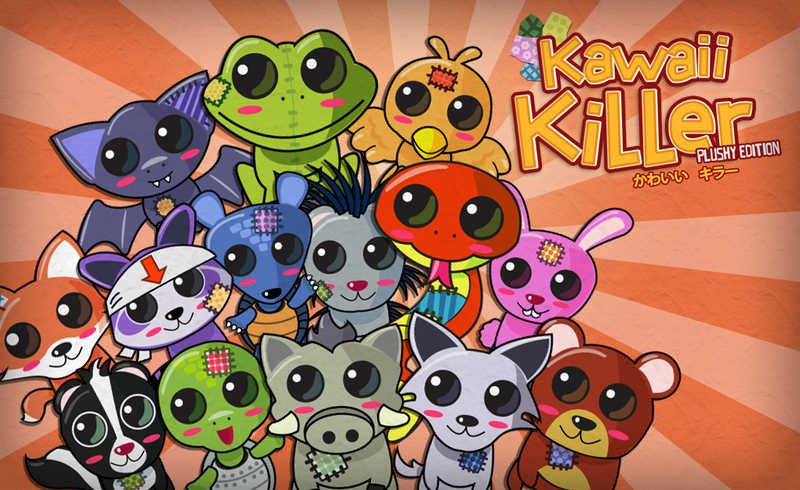 Kawaii Killer is an intuitive & fun game taking place in an environment where super cute graphics meets cartoon gore. You are Davy, a young trapper killing every single cute animal in the Kawaii Forest. But beware! Each animal is different! When the fox needs only a simple tap to be killed, you’ll have to perform a slice to kill a rabbit, while the frog needs to be torn apart using two fingers! You’ll have to face 14 different animals in Arcade mode, beat the timer in Speedrun mode, grab the gold medal in 36 challenges, and unlock all the badges in the game! And because you’re nice little trappers, here is a brand new trailer! Kawaii Killer: Gotta get ’em all! 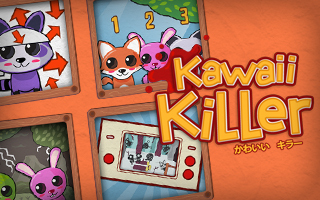 Do you have what it takes to collect everything Kawaii Killer has to offer? 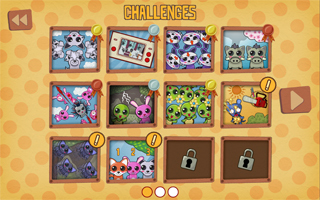 Improve your skills and try to unlock every single badge in the game! “What’s a badge?” you ask. It’s simple, when you complete an achievement, you get a badge! For example, the “My mom does it too” badge is unlocked when beating the game’s Arcade mode on the Easy difficulty, while the “Sick hunter” badge demands you to kill 200 animals in a row without anyone escaping. But that’s not all! In Kawaii Killer, you can equip your badges and use them in the game! Simply drag’n’drop up to 3 badges in the equipment zone, and the game rules will change and effects will be added, so the game can be easier or even harder. An example? Take this badge you’ll win if you kill 500 skunks, “Gas mask“. When this one is equipped, all skunk farts will be less powerful. And that’s only one badge out of 47 badges to unlock! See you next time for more Kawaii Killer news!